You’ve invested millions in getting superb broadband services into your customers’ homes. Your customer premises equipment (CPE) or residential gateway, as far as your customers are concerned, is the culmination of your efforts. It’s your brand, your badge, and represents you inside the home. Providing Wi-Fi, certainly. But also costing you to look after it while depreciating away in value. But what if that CPE became a revenue generator in its own right? What if it paid for itself (and then some) in cost savings? That is what Nokia WiFi can do for your business. To the tune of hundreds of millions of dollars. That’s no exaggeration. We’ve been throwing some numbers around based on use cases of our Nokia WiFi solution, and even we’ve been surprised by the full financial potential for service providers. If you’ve seen one of my previous blogs, you’ll know how Nokia WiFi delivers unsurpassed coverage, performance and an amazing user experience while the Home Portal allows your call center agents to get right inside the home network. Here’s how these features translate into dollars and cents. Let’s start with the obvious cost savings. Remember that around 35% of calls to your helpdesk are Wi-Fi related, each taking 20-30 minutes to resolve. Nokia WiFi uses a true mesh architecture, self- optimizing, self-healing, and automatic rerouting, so there’s hardly ever anything for customers to call you about. It’s Wi-Fi that just works, everywhere, always. But in the unlikely event of a problem, Home Portal allows your agents to detect and repair issues far more rapidly than the usual trial and error methods. Then, think about your business model. Selling Nokia WiFi gateways and beacons is an immediate revenue generator with good margins. Home Portal allows you to offer a managed Wi-Fi service as well. 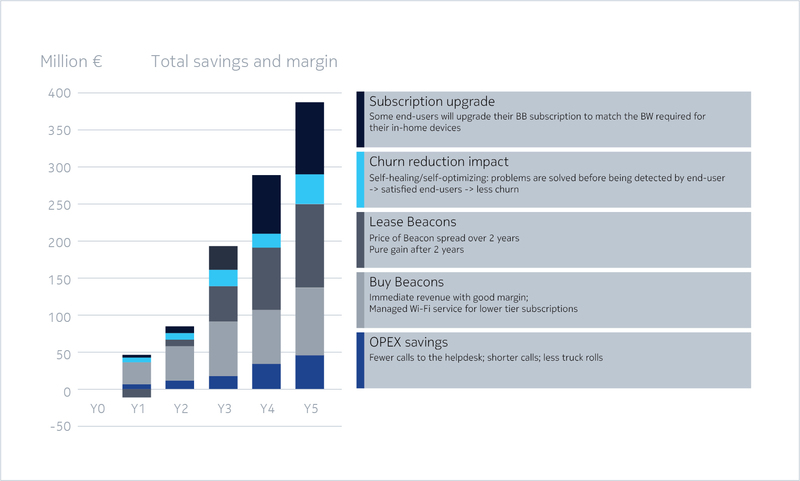 Even if you prefer to bundle the cost of the CPE into your subscription, the cost of our beacons is recouped after 2 years. After that, it’s more money in your pocket. Superb in-home connectivity is a real customer pleaser. And research tells us that poor in-home connectivity – even if it’s not your fault – leads to serious customer churn. The performance of Nokia WiFi will, therefore, reduce churn. But it also encourages upgrade. “My Wi-Fi is so good, I can get that 4K TV and maybe another tablet”. And more devices will drive subscription upgrades to higher tiers of bandwidth as customers realize that Wi-Fi is no longer a bottleneck. So, are you ready for the numbers? You might want to sit down first. If you have 5 million broadband subscribers, by our modest estimates you could increase your margins by €385 million over 5 years. €385 million. From in-home Wi-Fi. To learn how to create your own superior in-home Wi-Fi experience that sets your broadband free, visit our website.